The ACT session I attended turned out to be one of the best training sessions I've ever taken inside or outside of BNI. I highly recommend all members take advantage of these high-quality workshops. BNI Minnesota & Northern Wisconsin offers some of the most interactive and fast-moving advanced trainings in the world. Members who attend not only leave with increased knowledge and a new set of skills, but they often leave with real referrals in hand! ACT Workshops are 2-hour advanced trainings focused on specific topics to help you sharpen your networking skills. They are a great way to way to increase the involvement, education, and activity of your chapter members, and to network with members from other chapters. ACT Workshops are open to all BNI members and non-members. They are typically scheduled immediately following a host chapter’s weekly meeting, allowing the largest number of that chapter's members to attend. A chapter that trains together, becomes stronger together. For more information, send an email to support@bnimn.com. To schedule an ACT Workshop for your chapter, CLICK HERE or email support@bnimn.com. To view and register for an existing ACT Workshop, select "Advanced Training - Regional" as the event type on the regional Event Calendar. 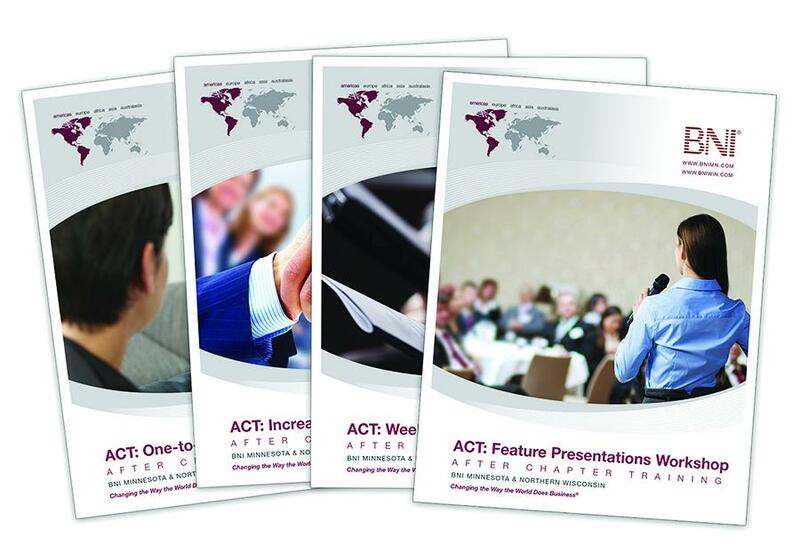 Some ACT Workshops have handouts or worksheets that participants use multiple times. CLICK HERE to access those handouts.